During my time in Belgium this past February, I took some night train photos. I was working through the day so night was really the only time I had to spend trackside. 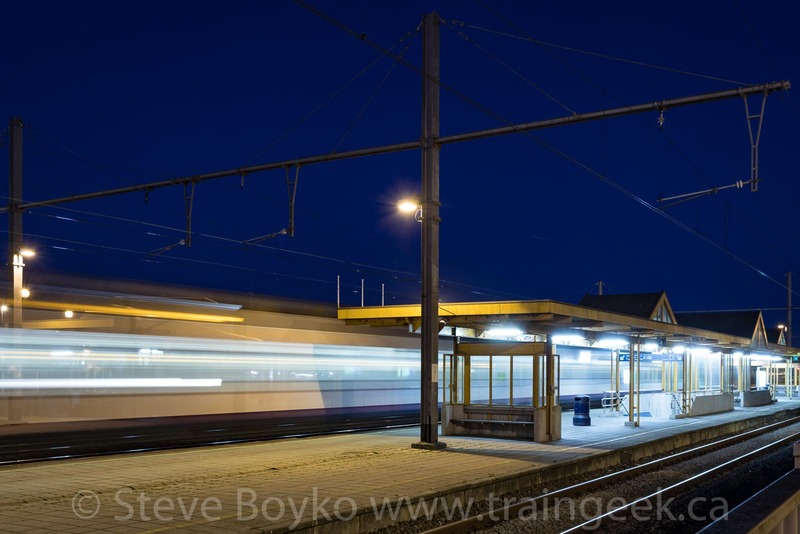 I ended up taking night photos on two different nights - February 12th and February 15th. I captured this westbound double decker train in Aalter as it paused for a station stop. 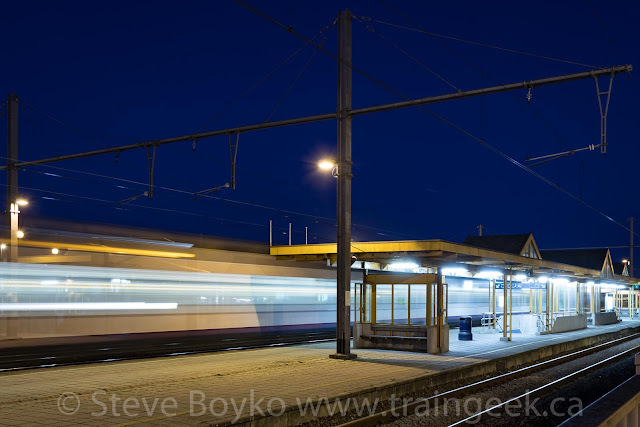 This was an 8 second exposure at f/8.0, ISO 100. As the train started on its way, I took a 10 second exposure. 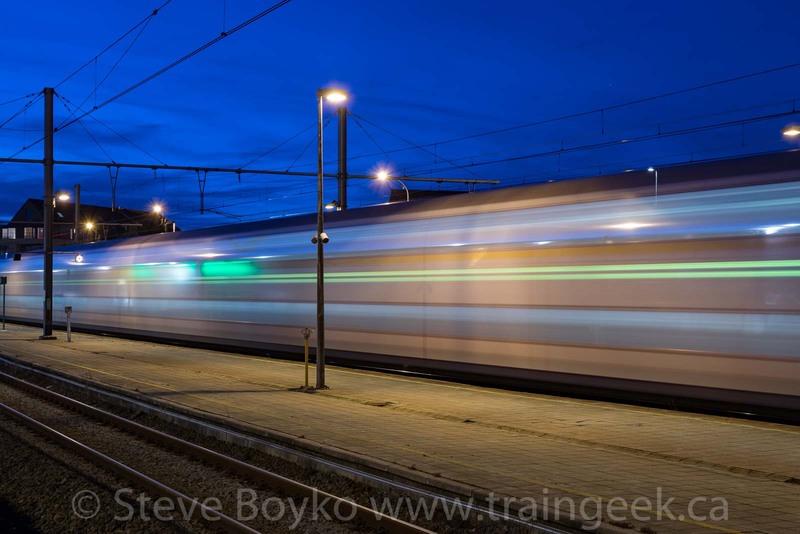 It's tricky to get the right white balance at night. All of these photos were a little yellow "out of the camera", so I tweaked the white balance in Adobe Lightroom to be more accurate to real life. If you know what white balance is, feel free to skip down to the next photo. Cameras try to accurately record the colour in a scene when you take a photo. However, the available light can fool a camera's sensor, which will lead it to record a photograph with some weird colours. For example, if you photograph indoors, flourescent lights make things appear more blue while tungsten lights make things appear yellow. These outdoor lights were tungsten. Your camera may be able to detect that and adjust. If it doesn't, you can adjust the white balance while editing the photo. This is what I did. Back in the film days, this adjustment was done by the processor when they made prints from your negatives. You can find more information on white balance here. 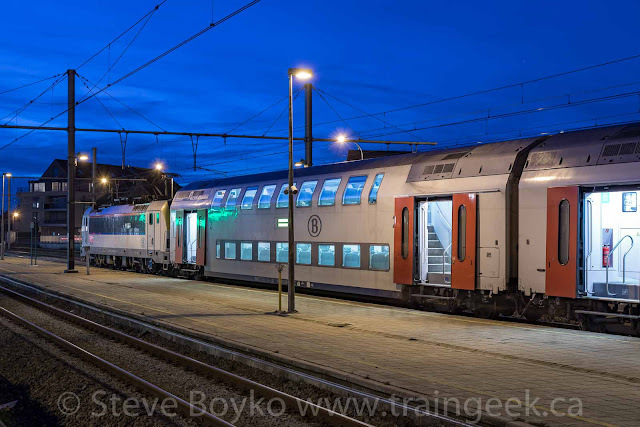 Here's a Desiro ML trainset at the station. I liked riding in these trains. They are quite comfortable and fast. 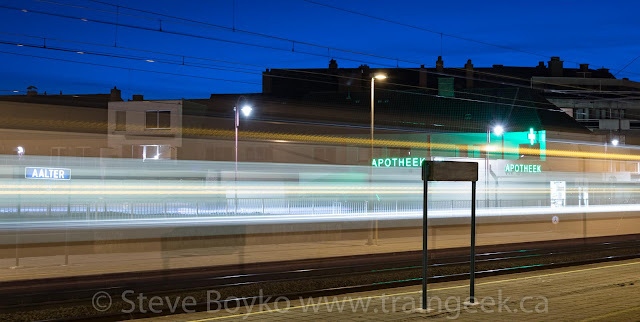 I decided to try a different location a bit farther down the platform, so I recorded another train passing the local pharmacy ("apotheek"). I believe this was a freight train but it's hard to tell! 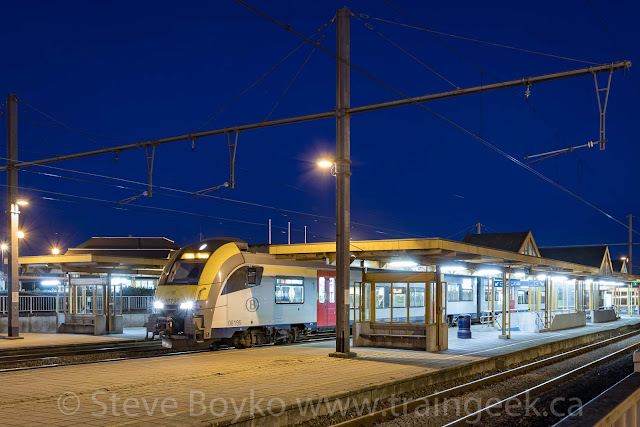 I was back at the station in Aalter on February 15 for more night photography. 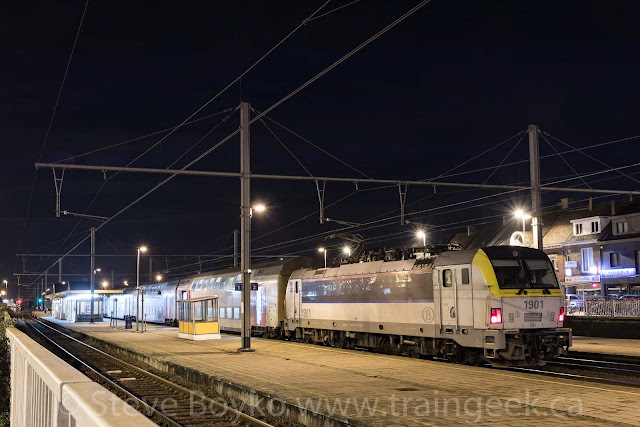 I liked the Belgian trains very much, the passenger trains do get a bit repetitive after a while. I had my camera (Canon 77D) and a tripod to take these photos. Usually I used the built-in 2 second timer so I could start the long exposure photo, then take my hand off the camera to limit camera shake while the shutter was open. This time the train went away from me, so you can see the streak of the red "tail lights" as it receded into the distance. 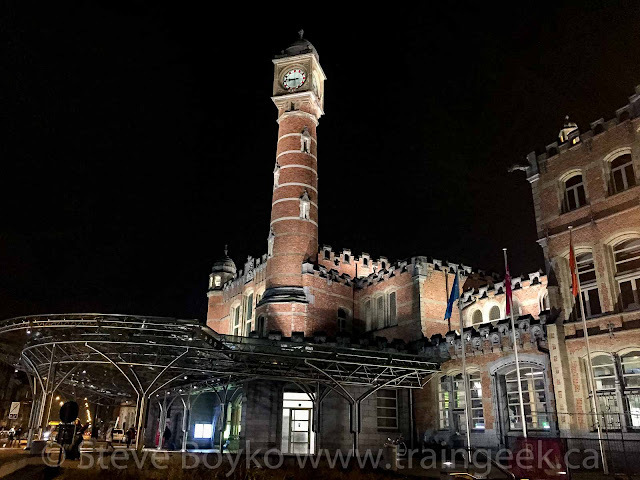 The only other night photo I'll share is this photo of the train station in Ghent ("Gent Sint-Peters") at night. It's an impressive looking station and I was happy to take a few photos of it. You did bring some chocolate with you. Can't wait!